At this early stage in the search for extraterrestrial life in our solar system and beyond, the emphasis is on liquid water. Where it can exist on a planet’s or moon's surface, so the thinking goes, life as we know it has a chance. Much of the observational and theoretical work in astrobiology therefore concerns the "habitable zone," the orbital band around stars where a rocky world's water neither freezes away nor boils off. "Atmospheric pressure affects the liquid water temperature range that is commonly used to define planetary habitability," said Giovanni Vladilo of the Trieste Astronomical Observatory in Italy and lead author of the paper published in the Astrophysical Journal. "So, if you wish to estimate habitability, you should explicitly take into account pressure in your problem." On Earth, the space around us is filled with air molecules that collectively weigh on our bodies. Although you cannot feel it, Earth's atmosphere presses down with the force of one kilogram per square centimeter, or 14.7 pounds per square inch. That pressure works out to about a ton per square foot. Our terrestrial biology evolved to operate in this pressure, which, while startling-sounding, pales when compared to underwater creatures' bodies in the deep seathat can withstand dozens of tons per square foot. Atmospheric pressure has an impact on water's boiling point when it transitions from a liquid to a gas. As anyone who has cooked at high altitudes has experienced, water boils there at a lower temperature than the typical 100 degrees Celsius (212 degrees Fahrenheit). The reason: Atmospheric pressure is lower at high altitudes than at sea level; there is simply less atmosphere pressing down the higher you go up in the mountains. Lower pressure is why it takes a few minutes longer to make pasta in mile-high Denver than below-sea-level New Orleans—the pasta has to soak and soften in the water longer to become al dentein Denver because the water is boiling at a slightly lower temperature. Vladilo explained why pressure has this effect. "Temperature is an indicator of the speed of molecular motions. The boiling point occurs when molecular motions are sufficiently fast to allow most molecules to escape from each other," and thus turn into gas, he said. "Pressure keeps molecules tight, so the higher the pressure, the faster the molecules must move—that is, the higher the temperature must be—for evaporation to occur." In Vladilo's new paper, he and his colleagues modeled a planet just like Earth in size and atmospheric composition. They ran over 4,000 computer simulations that varied the model planet's atmospheric pressure from one-hundredth to six times the atmospheric pressure of Earth. The researchers also varied the virtual planet's orbital distance from its sun-like star from about two-thirds of the Earth-sun distance to around an additional third. To get a sense of these orbital parameters, the former is a bit tighter than Venus and the latter more than half the distance out to Mars. The researchers' model estimated the global habitability of these Earth-like exoplanets by gauging the extent of the planet's latitudes that could possess liquid surface water. Through their modeling, Vladilo and colleagues saw that the habitable zone expanded in width as the atmospheric pressure increased. 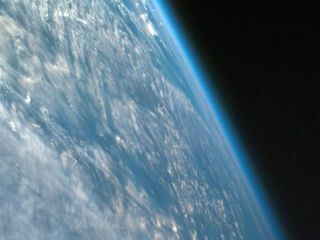 At a tenth of Earth's atmospheric pressure, the outer edge of the habitable zone reached just two percent farther out than Earth; not a lot of wiggle room for a low-pressure, Earth-like world, in other words, when it comes to habitability. But as the atmospheric pressure increased to threefold that of Earth's, the habitable zone extended out a farther 18 percent. For the same pressure interval, low-to-high, the inner edge of the habitable zone ranged from 87 percent of the Earth-sun distance to 77 percent. In this model, for a planet with Earth's atmospheric pressure, cloudiness, and humidity, the inner edge of the habitable zone is smack dab in the middle of this range, at 82 percent of the Earth-sun distance. The results indicate that an exoplanet just like Earth in all other respects but with a higher atmospheric pressure could be considered habitable about five percent closer to its sun-like star. Conversely, a low-pressure Earth would not be considered habitable unless placed in an orbit five percent farther out than a standard-pressure Earth. A main factor behind the expanded orbital range of habitability at higher pressures is that higher pressure atmospheres are denser. Denser atmospheres, in turn, transport heat better than thin atmospheres, and promote a stronger "greenhouse effect", whereby atmospheric gases absorb heat. For exoplanets farther from their star than Earth is from our sun, and therefore receive less sunlight, a high-pressure atmosphere traps heat better and distributes the greater warmth received at the equator. Polar zones that would otherwise freeze instead retain liquid water. A high-pressure planet can remain warmer at farther distances from its star accordingly. With regards to low-pressure worlds — hearkening back to the pasta cooking analogy — water boils at lower temperatures than it does on higher atmospheric pressure worlds. In a low-pressure scenario, a world closer to its star than Earth that would otherwise be broadly habitable with Earth's atmospheric pressure would have its water boil off. For closer-in exoplanets with a high atmospheric pressure, however, the sun-scorched equatorial zones would not heat to a boiling level as readily as in a normal- or low-pressure situation, and thus could still be habitable. A close-up of thermophilic algae living in Yellowstone National Park. In addition to these general findings, the researchers' model offers intriguing insights. For example, much of the gain in survivability on the closer-to-the-star side of the habitable zone for high-pressure worlds is for organisms that, at least by our Earthly standards, are extreme. The global temperatures on these inner-edge worlds made habitable by their high atmospheric pressures would be too high for complex life forms such as ourselves. So-called thermophiles, however — bacteria that thrive at temperatures more than 45 degrees Celsius (113 degrees Fahrenheit) or so and on up to considerably higher temperatures — might find such heat-blasted worlds quite comfortable. Overall, the habitable zone for creatures like us that require relatively moderate temperatures actually moves outward somewhat from a sun-like star in high-pressure scenarios. Atmospheric pressure could also have a profound effect on biodiversity. Compared to low-pressure worlds, high-atmospheric pressure exoplanets would have rather uniform global surface temperatures, again owing to the efficient transfer of heat amongst their latitudes. These heavy-atmosphere planets might host a fairly narrow range of life forms, since all would be adapted to the same slim temperature regime. Planets with lower atmospheric pressures than Earth, though, would have even more varied temperatures than our planet. These abodes might then provide an even wider range of habitats than our world, with organisms exotically adapted to their considerably more intensely varied polar-temperate-tropical bands. Titan's thick, hazy atmosphere cloaks the moon's surface. For now, research on a "pressure-dependent habitable zone" is somewhat purely academic, given that atmospheric pressure is not a property of exoplanets that we can yet measure. But Vladilo believes that work with planets several times larger than Earth, dubbed super-Earths, could be where the atmospheric pressure insights are first able to be applied. "At the present time, observations are able to determine only a few properties of planetary atmospheres, such as their chemical composition, and mostly for giant planets rather than terrestrial ones," Vladilo said. "However, I'm confident that technological improvements will allow us to characterize, to some extent, the atmospheres of super-Earths, which are reasonable candidates for studies of planetary habitability. If we will be able to estimate some basic planet parameters with observations, such as the planetary albedo [the amount of light reflected by the surface] and infrared flux [the amount of infrared light emitted], then our models will be sufficiently constrained to yield a reasonable estimate of the planet surface pressure." A major issue for assessing exoplanetary atmospheric pressures is the fact that the formation of atmospheres and the densities they develop is not well understood. Saturn's moon Titan, for instance, has a thick atmosphere with a pressure about 50 percent greater than that of Earth's. Yet similar bodies in the outer solar system, such as Jupiter's moons Ganymede and Callisto, cling to only very tenuous envelopes of gas. "It's embarrassing that we have almost no idea of atmospheres and where they come from," Sara Seager, a professor of planetary science and physics at the Massachusetts Institute of Technology who was not involved in the new study said. "It's one of those thing we can hope and wait to learn about." With regards to Vladilo's research, Seager said "it's refreshing to see that a wide range of surface pressures could enable a habitable surface." Vladilo and his colleagues plan a number of follow-ups with their model. Other subtle aspects of exoplanetary habitability remain to be examined in the ever-expanding scientific literature that matches the growing excitement for possibly detecting alien life in the near future. "The uptick in papers on planetary habitability is a telling sign of what's to come," Seager said.